Love them or loathe them, out-of-town superstores are now a mainstay of British shopping, being used by millions of us everyday of the week. Fifty years ago, however, things were very different. In many towns the small, independent trader still held sway, and many shoppers still 'shopped around' at individual retailers for the best bargains - visiting the high street grocers for their fresh veg, a butcher for meat, hardware or ironmongers for household utensils, shoe shops, ladies and gents' outfitters for clothes. True, some parts of Britain had already encountered the novelty of small, self-service supermarkets (an innovation from America), but these tended to be few and far between and - by modern standards at least - were pretty small afairs. For the major retailers who wished to develop the supermarket idea - Sainsbury's, Asda, and the like - town centre locations did not provide sufficient room - and (as was becoming increasingly important) they had little car-parking space nearby. The solution? Build new, purpose-built super-supermarkets on new sites at the edge of towns, easily accessible by road, with ample car-parking spaces, and a sufficiently wide range of goods under one roof the make it unnecessary to shop anywhere else. Although retailers such as Sainsbury's had been first to embrace the in-town supermarket concept, it was to be a relative newcomer to the British shopping scene who first established the big out-of-town superstores we know today - Asda. And their first location to try out the concept was at WestBridgford, just southeast of Nottingham. Fifty years ago the building seemed huge (11,000sq.ft. of floorspace) and sold an amazing range of stock which had never before been gathered together under one roof - not just food and groceries, but furniture, clothes, sports goods, music, toys and carpets. There was also a restaurant and even a pharmacy and shoe repairers. This page was added by Website Administrator on 29/01/2018. 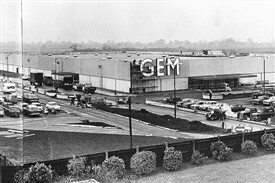 I thought the store went under the name of Little Gem before becoming ASDA! Anyone else agree? You're right, Tom. It was originally called GEM - an American firm, the acronym standing for Government Employees Mart. The company was very successful in the US and expanded to England with their first store - and hence Britain's first superstore - appearing on Loughborough Road in West Bridgford in 1964. It was a while after this that the W Bridgford store was taken over by Asda - but I'm not sure when.